Most owners look forward to being able to take their dog out for a walk, but if the dog pulls all the way, it is very tempting to make the walks shorter and shorter. The best thing is always to teach your puppy to walk on a loose lead and then he will not get into bad habits. This is not the same as expecting your dog to ‘heel’ (walk closely by your side), but means that there should always be a bit of slack in the lead so that you don’t finish a walk feeling like your arm has been pulled out of its socket! In the past this was often ‘taught’ by yanking on a dog’s lead each time he pulled. This can have the opposite effect to what you hope for, i.e. the dog learns to pull harder – you yank dog, dog yanks you. It can also do a lot of damage to a dog’s neck and throat while he is ‘learning’. You will often see adult dogs being yanked and checked in this way – proving that the method certainly hasn’t worked for them. Nowadays we approach it in a rather different way – we explain to the dog that being on a loose lead, walking near to your side is more rewarding that pulling. So, how do we do that? As with all the exercises we reward the dog for doing the right thing. There are a few ways of doing this, two are outlined here. For these exercises your puppy/dog should be wearing a flat collar or fixed harness and a standard (or training) lead. Do NOT use a choke chain or extending lead. The first hurts and has no place in training and the second will allow your dog to rush off too far. The dog can walk on your left or on your right. For ease of explanation I will explain as if your dog is going to walk on your left – if you want him to walk on your right, just reverse the instructions. It is a good idea to get your dog used to walking nicely on both sides, but don’t let him cross sides mid-walk as this can easily trip you up if you are caught unawares. If at any time during the exercise your dog pulls, it is very important that you stand still and keep the hand holding the lead in the same position. Your dog is pulling for a reason – to get somewhere faster, to investigate a smell, to reach another dog etc. If you let him pull you towards his target, then you are rewarding him for pulling. Walking on a loose lead is hard work for your dog, so make sure the treats are high-grade, at least to start with. If your dog is not food-motivated, then use a toy by all means, but it does make things slower as each time you reward you have to stop and have a game. So, if he finds food rewarding (and most do if you choose the right food), try and use that. Hold the dogs lead in your right hand, have some treats ready in your left hand. Get your dog’s attention and, using the treat lure him into position (ask him to follow the treat) until he is standing beside you, facing the same way as you are, then give him the reward. Using the food in your left hand, lure him forwards a step or two and as long as the lead is loose reward him. Take a few more steps, reward again, and repeat for as long as he is walking with a loose lead. You may find he dashes off after getting the reward – do not move! Stand steady, when he stops pulling, get his attention and lure him back into position beside you, couple of steps, reward. If you are clicker training, you will know that it is important to ‘mark’ the exact behaviour, i.e. walking without pulling, before rewarding. You may find it easier to use your click word rather than the clicker itself – you have lots of things in your hand anyway! If you are not clicker training I would still suggest that you mark the behaviour. To do this – as your puppy is walking on a loose lead – say ‘Good’ or ‘Yes’ and then feed him a treat when he is standing still. In this way he will know that he is getting a reward for walking nicely, but by feeding him when he is standing still you are lessening the risk of him choking on the food. If you just fed him when he was standing still (without marking the behaviour), then he would think that you wanted him to keep stopping. 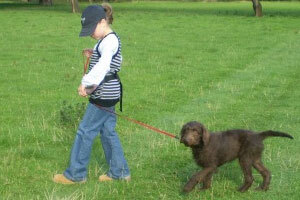 When your dog is able to walk two or three steps on a loose lead you can start to increase the distance between treats – reward for three of four steps walking nicely, then maybe four or six, then for three again, gradually stretching out the distance between treats but remember to not just increase the gaps, surprise him by sometimes rewarding for just a couple of steps. Once your dog is able to walk about ten paces without pulling you might want to put in a cue word – ‘walk nice’, ‘with me’ or similar works quite well. With this exercise it is important that you say what the dog is doing rather than what you want him to do, i.e. if he is walking nicely, say so. If he is pulling and you say ‘walk nice’ (before he understands the cue), he will think that ‘walk nice’ means pull like a train! On the same note, if you do not have time to stand still if he pulls or reward lots of nice walking – perhaps you are rushing to meet the children or similar – then when he does pull, it is better to say ‘pull’. In this way he will associate the word with his action. Or you could get a training harness and put this on him when you are not able to do the training. A training harness is one that restricts his forward movement when he pulls. Remember that this is a training exercise and, like all training, is very tiring to start with. It might be an idea to introduce the exercise to your dog in the living room, or in the garden before actually taking him out to practise. Keep the training short, just a few minutes at a time to start with. If you take him on a full walk using this exercise, you will have a very tired puppy at the end of it and then the training will not be so much fun for him. This exercise is based on the understanding that each step you take energises the dog. Stand still and wait for your dog to loosen the lead – reward. Give him the reward beside you – in this way he will learn that being beside you is a good place to be. Take one step – your dog may well rush off – stand still and again wait for him to come back and stand beside you. This may take several minutes, be patient – reward. Take one step – this time your dog should come back to your side a bit quicker – reward. When you can take one step without the dog rushing off, you can try two steps. Do not be surprised if he dashes off again. Stand still and wait for him to come back. Reward by your side, two steps, wait, dog returns, reward. When he can walk two steps without dashing off increase to three, when he can cope with three steps increase to four etc. When you take the first step, it can take quite a long time for your puppy/dog to loosen the lead/come back to you but if you are patient he will stand still eventually. Do not be tempted to pull him back, just wait. The time it takes for him to loosen the lead will lessen each time. But when you add in another step, the time may increase again. You might need to take just one step at a time for several steps, but again as the exercise progresses so the intervals between increasing the steps will get shorter and shorter. As with the previous exercise, do not introduce your cue word until he is managing at least several paces, and do not continue the exercise for more than a few minutes. Taking your dog for a walk should be enjoyable for both of you. Remember that he is going out not just for the exercise but for stimulation – let him have time to sniff where other dogs have been. Just don’t let him pull you to the places and do expect him to come away from the smell when you ask him to!